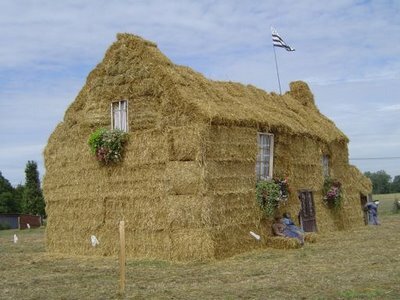 House of straw. One of the many reasons that attracted us to our current plot was that part of the land is constructible, i.e., it has outline planning permission to build a house. We have a certificat d’urbanisme and, once we have designed our house, we will apply for a permis de construire. If you’ve visited our blog before, you’ll know that we’re both afflicted, to varying degrees, with a lack of patience. So, with architects costing so much, and the infamous French bureaucracy to contend with, we thought we’d just get on and do it. We didn’t even read the books, I mean, how hard can it be? But we did consult three little porky friends of ours who have various building skills. You can see the results above. Beware the wolf … and I’m not so sure how waterproof it’ll be! The house is, in fact, one of many straw sculptures that have just appeared to celebrate the harvest, I assume, and also to promote various fêtes, the most famous of which, round these parts, is the 30th fête du blé at Pleudihen. 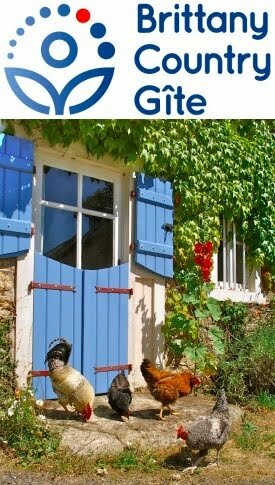 There will be food, music, demonstrations of old machinery and skills and a Fest Noz (Breton for “party night”) at the end, a sort of Celtic barn dance. We will be particularly interested to see the demonstration of old machinery and methods of bringing in the harvest. We’ve seen the local farmers driving huge tractors, following even huger combines, and then producing the massive round bales which need said tractor to load onto huge trailers. All of this relies on fuel and with prices rising, instability in the Middle East and the phenomenon of peak oil we may yet see men and women with scythes and pitchforks back in the fields, loading up horse drawn carts, in our lifetime. Don't be fooled by "peak oil" though... I think it's a rather convenient myth used to control prices and justify expansive military policies. There's much evidence for there being lots more oil than we can afford to burn! If we really were running out of oil, various forms of free energy already available wouldn't be suppressed and buried so quickly. Thanks for dropping by and leaving a comment, whoever you are! By the way you can post "anonymously", i.e., without having a Blogger account, but still finish with your name, which is nice and friendly. You've made an interesting point. My, perhaps too rudimentary, understanding of peak oil is that the rate at which we use oil is out of proportion with the rate at which we're finding new sources of oil. With the huge appetites for energy of rapidly developing nations such as India and China, along with the West's continuing profligacy, we're going to run out of this resource ever more quickly, whether it's in my lifetime, a hundred years or much more. When you say that there's more than we can afford to burn, I assume you mean in relation to CO2 production and Global Warming. Whether we're genuinely running out of this resource or producing way too much CO2 or both, the lesson has to be that we need to reduce our energy consumption and encourage production and use of renewable energy, which I'm sure you'd agree with? And one final comment, many commentators have predicted that the next wars would be over water rather than oil and the Middle East is one of the most water short places on Earth!